We're not in the business of giving people food or a bed in perpetuity. We're in the business of finding a solution to this problem. Our goal is to tackle the root causes of this issue and provide people with services that help them transition out of homelessness. Sure, sometimes that involves a bed or a meal for awhile, but not forever. Talking to Monica, we found that we have a lot in common in trying to transform how our respective institutions serve and interface with the community. Monica is trying to reposition her organization as a social justice organization working on solutions to end homelessness. I'm trying to reposition our museum as a cultural hub supporting creative and intellectual community growth. Both of our organizations are classically seen as insular organizations that serve specific, closed audiences--homeless people in her case, cultural elites and students in mine--and we're both trying to demonstrate that our institutions not only have value for the whole community but also opportunities for everyone to get involved in a meaningful way. I know that every museum has these ambitions to some extent and that the rhetoric of many crosses these boundaries. But how many institutions are really aggressively transforming their work away from service to a narrow band of audiences to community-wide advocacy work? These museums work differently. They have different goals they are shooting for. I know my museum is very far from these goals--we're still just laying the groundwork to be able to provide consistent cultural services to the community. But even as we do so, we're thinking about it in terms of changing and supporting how culture and learning happens in the County, not just at or via our programs. That's why I'm talking with people like Monica, to understand how the museum can be a partner in how we make progress throughout the community--not just at 705 Front Street. I want our museum to be the host for dialogue--not just through panel discussions, but through exhibitions and events and commissions and community experiences that both invite and challenge people to engage with each other around the issues that matter most. And I think that requires us to be an advocacy organization--not for homelessness or oceans or children--but for the power of art to transform, the power of history to enlighten, and the power of a welcoming host to spark new ideas and change. Does this sound like director-ish bloviating to you, or is it useful? How do you see institutions living up to--or falling short of--these kinds of goals? As a freshly-minted museum director, I knew I'd develop at least one micro-managing quirk, something that would drive me totally nuts (and drive me to drive my staff nuts in response). I've found that thing. It's exclamation points. Our whole team has been working to make our museum a more friendly, welcoming place, both in the building and online. I am completely impressed by the way that everyone, staff and interns alike, have taken up this call. The problem is exclamation points, which pop up unbidden, proliferate, and choke the goodwill of our messages with an over-cheeriness that swallows up the light. I've become the punctuation Grinch, walking into the museum at 7am, peeling exclamation points off the signs that invite people to Enjoy the Sculpture Garden!, capturing screenshots of overzealous Facebook updates and asking staff to please tone it down. Exclamation points aren't exclusive to my museum. I see them everywhere, especially in institutions and exhibitions that cater to families and children. Watch the Step! Build a Bridge! It's Big Brother in a smiley face emoticon mask. I wish I had the authority in these other venues I have at home to tear the damn things down. My sensitivity to this issue is undoubtably due to the fact that I myself am highly prone to enthusiastic displays of all kinds. I get the problem because I am the problem. I frequently have to revise my emails to reduce the number of exclamation points from three or four to one. The exclamation point is a kind of shorthand for all the goodwill and energy any of us feel for the things about which we are most passionate. I know how it feels to want to tell someone, "Amazing workshops and demos today at Experience Clay!" or "Great idea!" We feel personally invested and excited, and so we exclaim. Excitement is good, but it's hard to direct it to a broad audience of visitors and passersby. Passion is best communicated personally, so that the receiver can soak in the directed energy of the giver. Exclamations fall flat when they are shared in the impersonal, one-to-many format of most museum communication. If a staff member talks a visitor through the museum map and then scrawls, "you will love this exhibit!" over a particular area, that statement feels genuine. It's infused with the specific energy of the relationship between those two people, no matter how brief. But that same statement printed on the map for all to see feels like a fraud. It turns a personal sentiment into a banal, desperate sales pitch. It's also just plain sloppy from an editorial standpoint. There are many more powerful ways to convey enthusiasm, conviction, and energy through words than employing shorthand like capital letters or exclamation points. The most impassioned arguments do not rely on exultant punctuation. They rely on carefully-chosen language, pacing, and tone. Good opinion editors--and advertisers--don't use exclamation points. Finally, as a visitor myself, I find exclamation points incredibly distracting. If the point is for visitors to enjoy the sculpture garden, what does the exclamation point add? Am I supposed to enjoy it more because of the exclamation point? Should I be surprised that there is a sculpture garden to enjoy? Should I enjoy it urgently? Even in situations where exclamation points are used to convey some surprise, i.e. "Orangutans Overhead!" at the zoo, I'm not sure that the exclamation point helps me. Is it supposed to convey that this is a fun opportunity to see animals above me or a cautionary message about potential danger? The exclamation point is an unnecessary bit of flash, a crutch that hinders more than it helps. I know that every exclamation point that interns, staff members, or I put into museum communication is just meant to convey our own individual enthusiasms for the programs or projects at hand. But that conveyance is lost in translation to visitors and Facebook fans. It is distorted into a cheap plastic sentiment. It feels oddly aggressive. And it's just plain confusing. I'm not arguing that we should drop our passion and excitement for what we do. I just think we need to be more rigorous in finding the best ways to express it. The Spectator Spectrum: Who Do You Count as a Participant? Ready for a math problem? A museum holds a free program in a semi-public space. Fifteen people engage in the prescribed activities. Approximately 100 people walk by while the program is going on. Some of them look and point, some talk about the program, and some completely ignore it. This is the question I've been toying with this week. Last weekend, my museum did a little pilot of a new program, Downward Draw. We held a free yoga class in the plaza outside the museum and invited artists to come and draw/paint the yoga-doers in motion. It was a creative stretch for everyone involved--people who had to draw quickly, exercisers who had to hold poses for longer-than-normal time periods--and everyone had a good time. That included spectators. People looked and talked and pointed. One guy stayed to watch the entire session and then talked to the yoga practitioners afterwards. A woman convinced her husband to draw and then sat watching him over his shoulder. A couple of dads watched and chatted about the event with partial attention as their kids cavorted in the fountain. For me, Downward Draw provided an unusual opportunity to examine the more casual end of the participatory spectrum. For years, I've used Forrester Research's five social media user categories--creators, critics, collectors, joiners, and spectators--as a guide when thinking about how to design participatory experiences in physical space. But I've tended to focus in the middle of the spectrum, seeking ways to offer more options for engagement than just "create the thing" and "see the thing." And so I've spent a lot of time piloting exhibits and programs that invite people to critique, to join, to collect, and to create. When prototyping, I'm frequently in a cajoling mode, trying to entice people to try the active form of participation to see what works and doesn't. But that wasn't my role with Downward Draw. Or rather, when I tried it (offering paper and pens to spectators in case they wanted to draw), I failed completely. The activity was so specific and required sufficient planning/equipment/strength on the part of participants that it was in no way a drop-in experience. And so I tried something else. I watched what spectators did. No one did anything shocking. People cruised by. They watched. They pointed. They ignored. They asked. Once I dropped the pretense of pushing active participation on spectators and just engaged with them in conversation, I found I was having a whole other kind of participatory experience--one in which strangers were using the spectacle of the event as a social object of conversation. The spectators weren't passive; instead, they were active participants in a different activity: looking, evaluating, discussing the thing in front of them. Even though the participation was pretty simple, I realized I don't have a good framework to measure or describe what they were doing. How would you measure spectator participation in this event? Would you set a bar for "active participation" (looks for more than one minute, points at something, talks about the event/object) and count incidences? Setting a bar would allow you to eliminate the passers-by who ignored or barely noticed the event. On the other hand, we don't set this kind of bar when it comes to counting audiences inside our walls. You can sleep through the symphony and it still counts as showing up. You can walk through a museum while having a heated debate about your love life and it still counts as visitation. By the same argument, you could say that anyone who passed by Downward Draw was a participant, however uncommitted. They still got that "contact high" of engagement, and who knows what that may inspire. When I really think about it, I think it's important to attempt to define indicators of participation--at every level. It may be impossible to measure how many visitors are pointing or talking about an exhibit or asking a question, but knowing that those are indicators of active engagement helps staff know what to look for and what outcomes to try to achieve. Binary measures of participation--inside the walls or out, doing yoga or not--only scratch the surface of helping institutions understand what's really going on. I want to honestly be able to say to my board, "nine people did yoga, six people painted or drew, twelve people engaged a staff member in discussion, fifteen people had private conversations about the experience, fourteen people gawked, and thirty people strolled by with a fleeting glance in our direction." I don't have the framework to make this useful yet. For now, the math problem's answer is the favorite cop-out of every struggling student: "not enough information." Can you help me develop a framework for indicators of spectator participation? What behaviors would you put on the list? It's a rough week for cultural practitioners. In the Netherlands, State Secretary for Culture Halbe Zijlstra slashed 200 million euros from the national budget for the arts, leading to the close of the innovative National History Museum project and crippling many superbly inventive and inspiring organizations like Mediamatic and the Waag Society. In Minnesota, the state budget standoff has closed the Minnesota History Center and the many other arms of the MN Historical Society. And here in Santa Cruz, I've got two very expensive bottles of champagne on my desk. Well, they only cost me $8 apiece... but we aren't opening them until we have $50,000 committed to each one. Let me explain. When I came to become the director of The Museum of Art & History two months ago, we were on the financial brink. We were operating week-to-week and racking up unpaid bills. Within ten days on the job, I made two tough decisions. I laid off a full-time employee, and all remaining employees (including me) took a 20% salary cut. Now, our fate--and our salaries--lies partly in the hands of those champagne bottles. When we can raise $50,000 in an operating reserve, we'll open the first bottle and our salaries will go up to a 10% cut. When we raise $100,000 in operating reserve, we'll open the second bottle and go up to full pay. I am doing everything I can to ensure we will be spraying that champagne all over ourselves within a year. We've had two months in the black and we're going to keep pushing. This is the first time I've really grappled with the reality of "the museum as a business." Sure, I've been part of discussions about business models and have written/tracked plenty of budgets, but I haven't dealt with money on the day-to-day, how-am-I-going-to-pay-this-month's-payroll, feel-like-rockstars-as-we-reduce-our-liabilities level. It's surprising to me how unaware I'd been of this side of the work and how much of my emotional space is focused on it now. I feel as much pride about having a month in the black as I do about some of the great programmatic projects we're launching. At my institution, we're trying to build our capacity around this both by opening the books to staff and by use of public visual metaphors like the champagne bottles. Turns out those champagne bottles are the best marketing tool we've got--everyone who walks in my office asks about them, and we've received several donations from people who tell us they want to help open the first bottle. On our website, we're telling people how much it costs us per day to run the museum (about $2,500) to help everyone understand how essential their donations are to our service to the community. I've been thinking about a sign at the front desk clearly showing people how donations of different levels support different institutional needs... but frankly, the numbers are so high that it's a little overwhelming. I'm still working to find the most digestible ways for people--staff, volunteers, visitors, supporters--to understand where our money comes from, where it goes, and what it's for. I suspect there's a lot more we can be doing, both for our professional field and for constituents, to increase awareness and understanding of the business of museums. What has helped you grapple with these issues? What do you wish you knew? I'm thinking about proposing an AAM session on this topic and I'd love to hear your thoughts. I've now been the Director of The Museum of Art & History in Santa Cruz for two months. Yesterday, a lovely article came out in the local paper about what we're trying to do to become a thriving community hub. Lots more on this in the months to come, but I thought you might like to read the article. It really reflects what we're trying to do here to transform our institution into as relevant, dynamic, and successful an organization as possible. Let me know what you think and what this brings up for you. SANTA CRUZ -- At the foot of the stairs leading up from the vast atrium to the galleries at the Museum of Art and History in Santa Cruz, there used to be a prominent "no" sign -- as in "No Photography, No Food, No Drink, No Smoking, No Pick-Up Basketball Games, No Super Soaker' Squirt Guns, No Singing Out-of-Tune Renditions of Don't Stop Believin'," etc. OK, so we made up the last couple of those prohibitions. But the point is that the MAH, like just about every other museum in the known universe, was content to define the museum experience as something removed from the outside world, a rarefied church-like space of refined artistic reflection. When Nina Simon became the MAH's new executive director in May, one of her first unilateral actions was to cover up the no sign. It wasn't that Simon was throwing out the housekeeping rules of the gorgeous but often imposing downtown museum building. Instead, whether she intended it to be or not, it was a symbolic act of not only a new regime at the MAH, but a new idea of what a museum is supposed to be. -- and many of the world's big-city museums brought her in to help them figure out how to shake off the fusty image of museums and embrace modern times and modern audiences. 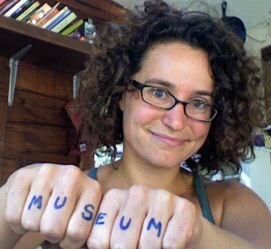 Simon's new job is her first shot at putting into action herself what she has been urging other museums to do. "What do we have to do differently?" she said. "The first part is saying yes and being open to the community." Her goal is nothing less than to remake the MAH as the primary cultural touchstone of the Santa Cruz community, the place that best embodies the unique cultural vibe of Santa Cruz. "We all know Santa Cruz is such a creative place," she said. "And yet, when you look at where is that epicenter, where is that hub, it's very diffuse and unclear." In Simon's vision, the MAH should be that epicenter, the mothership of Santa Cruz downtown culture, the first place that an out-of-towner would go on a mission to understand the city's dizzyingly diverse culture. And yet she backs up the bromides with concrete ideas. Her mission in her blog has been to rebrand the experience of going to a museum, chasing away the old ideas of a quiet temple of tweedy art appreciation by generating new ideas of what a museum could be. "What's the quintessential Santa Cruz welcome?" she said. "You know when you land in Hawaii and they put a lei around your neck? I keep thinking what we should be doing in the lobby is that kind of thing. We are going to be doing a lot in the lobby to increase the Santa Cruz-ness." That doesn't entail a big, expensive redesign. Instead, she plans to bring a variety of working artists, one at a time -- "somebody painting, or shaping a surfboard, or sculpting" -- as a kind of live demonstration of art as it is being created. She also plans to better employ Abbott Square, just outside the Cooper Street entrance to the MAH. In mid-July, the museum will host "Experience Clay," weekend workshops for those interested in clay sculpture. Simon is busy soliciting ideas from museum visitors, staffers, and the young interns that she's bringing in. Ideas include combining Santa Cruz's famous love of yoga with life-drawing classes, having models incorporate yoga poses for the sake of the would-be artists. In September, the MAH will be partner with Santa Cruz Next for "A Race Through Time," a kind of scavenger hunt incorporating places that don't exist anymore in Santa Cruz. Later this year, the museum is planning to institute a "wearable art" ball, combining the energies of the annual FashionART event, the defunct Seventh Sense wearable-art event and the once popular Good Times Halloween ball into one dynamic new event. The focus, she said, will be more toward events. "What motivates people to come to the museum is not the idea that there's something that's open for the next three months and they can come any time. What motivates people to come is that wow event, that day where there is something they really want to be there for." That Simon, the world-traveling consultant, finally gets a museum to call her own is something of a happy accident. She came to Santa Cruz County in 2007, not for the sake of the MAH, but because she and her husband decided to leave Washington, D.C., where she worked at the International Spy Museum. "We painted a big map of the western U.S. on our wall, looking for a particular kind of place," she said. "We started looking around for a small city, progressive, good outdoor access, good for vegetarians." And Santa Cruz won the lottery. It wasn't until 2010, when MAH executive director Paul Figueroa resigned for health reasons, that the idea of the potential fit between Simon and the MAH first emerged. She had been traveling extensively, but was, she said, beginning to feel resentment for not getting to explore her newly adopted hometown and to get involved in the community. "The reason I was interested in this job is because last fall the trustees put out a new strategic plan with a vision statement that positions the museum as a thriving central gathering place around art, history, ideas and culture," she said. "When I saw that, I thought, If they really want to do this, then I don't want to just help out casually as a volunteer. I want to make this happen.'" The first thing Simon has had to do is address a funding crisis at the MAH. She dropped one position on the museum staff -- the museum now carries eight paid staffers -- and reduced everyone's salary by 20 percent. She is working to build up the museum's operating reserve and get it back on its feet again, while maintaining that innovation and rethinking the museum's purpose are vital methods to achieve financial stability. She is also working to bring into closer harmony the museum's dual mission: to be a repository for local history artifacts and to promote art exhibitions. Future exhibitions includes "Santa Cruz Collects," with a focus on the eccentric and intriguing collections of local people; and "Love and Spirituality," a historical perspective on spiritual movements in Santa Cruz County with ceremonial events planned to coincide with the exhibit of art works and artifacts. An upcoming woodworking exhibit will feature a fort built on the premises. Simon is living with high expectations not only in Santa Cruz County, but in the larger museum community where observers are eager to learn what she can do on a blank canvas. "Yes, I have big dreams, but I don't think they are hyperbole," she said. "I've seen how this works and I've made it happen in other places. I've never been in a community with more participatory enthusiasm from people, or a more beautifully situated museum. "Lots of people now don't even know where the museum is. We have to say, it's right across from Trader Joe's. In three years, I want to hear people say, Hey, where's Trader Joe's?' Well, it's right across the street from the museum.'"